All reservations must be made by midnight, two days prior to arrival. Individual sites become available both online and through the call center 340 days prior to the start of the reservation. Nightly and monthly camping fees (including multiple monthly reservations) must be paid in full when reservations are made. Senior Citizens receive a 10% discount from the daily Peak Season camping rates. o Seniors must be sixty (60) years of age to qualify. o Proof of age or Golden Buckeye Card must be presented at check-in. Former Prisoner of War (POW) or 100% Disabled American Veterans receive a fifty percent (50%) discounts on Peak Season camping rates and all monthly camping rates. o Verification from the Veterans Administration (VA) is required at check-in. Cancellations must be made by contacting the park directly. Greater than thirty (30) days before the reservation: Full refund back on their credit card. Between thirty (30) days and four (4) days before: $10.00 and the balance will be refunded on their credit card. Less than four (4) days prior to the reservation: Equivalent of one (1) night’s stay and the balance will be credited back to their credit card. Monthly reservations are on a “first-come first-serve” basis. All fees are paid in full at the time of reservation. Unlike Seasonal designated sites, inventory is not set aside specifically for monthly reservations. Monthly and nightly reservations are available on all Transient lots. Because of the constantly changing dynamic of reservations, in order to reserve an uninterrupted stay, you must book monthly reservations in advance to ensure that other customers do not book a future stay on the same lot. If you would like to have a continuous month-to-month stay on the same lot, please book the lot for the entire length of your anticipated stay. 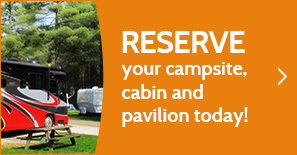 Campers who have made a reservation are permitted to arrive at any time during their reservation. This may result in some sites remaining empty for a period of time. The park is obligated to hold a reserved site until a cancellation is made. We thank you for your understanding when you see unoccupied reserved sites. All campgrounds have set aside first-come, first serve “Walk-in Sites”. If a reservation has not been made on a reservable lot, this lot may be available for walk-in customers but the camper must check with the office prior to set up to ensure the lot is available for the duration of their anticipated stay. The equine area has camping pads to accommodate trailers and equipment. This area is designated for horse campers only, general camping is not permitted. All parks offer off-season camping at reduced rates. Water is shut off to all full-hookup sites during the off-season to prevent waterline freezing. A shower facility is open in each park during the off-season. Check in: 4 p.m. / check out: 2 p.m. Availability: Most parks are available year-round. Check with Atwood Park for date details. ADA Accessible Accommodations: Available at most. Check with Atwood Park for details.